41 Long Colt ammo or simply “41 Colt” is an old west round developed by Colt in the late 1800s. “The Thunderer” was Colt’s first attempt at producing a double action revolver. The weapon and the round were a success and the Thunderer became the first successful American double action revolver. The 41 Long Colt was a powerful cartridge and the Thunderer was a small revolver at the time. The 41 Colt found a niche with the average man and women, not the old west gunfighter. This small revolver and it’s powerful round made it an excellent weapon for concealed carry in the post Civil War world. The round was popular up until World War 1 when the firearms world had adopted the Smith and Wesson and Colt 38 Specials. After World War 1, the round still had a small following, but completely disappeared after World War 2. The world was looking ahead and the 41 Colt was part of the painful past. The 41 Colt was known to be surprisingly accurate, and it’s main accuracy drawback was the Thunderer’s heavy double action trigger. The 41 Long Colt has experienced a resurgence with the rise of the Single Action Shooting society, and so has the Colt Thunderer. The reason being, many shooters want something a bit different than the standard Colt SAA. The 41 Long Colt is still being produced in modern target loads. 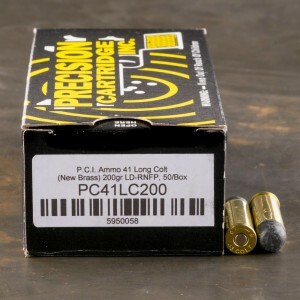 Very nice ammo, great folks to work with!